If you are looking for a holiday home on the French Riviera, the stock of available properties just got smaller. 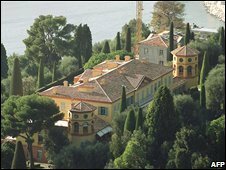 With grounds so grand that it takes a reputed 50 gardeners to tend them, the Villa Leopolda in Villefranche-sur-Mer has been snapped up by a mystery Russian billionaire. Built by King Leopold II of Belgium in 1902, the sumptuous villa has been graced by world leaders and superstars. With the credit crisis causing turmoil in the world's financial community, and property values falling generally, you would expect the price to have tempered a little. But no, the mysterious buyer is expected to hand over a whopping 500 million euros ($736m:£397m) for this luxury home on the Côte d'Azur. It is all down to a shortage of supply and rising demand from rich business people, according to luxury estate agent Jonathan Hewlett, who has recently sold a London pad for more than £100m. "The increase in the mega high net worth individuals globally is on a march," the Savills director told BBC News. "And they are very specific about where they want to live." Central London and the French Riviera are the current hotpots for Russian buyers, according to Mr Hewlett. The Villa Leopolda price-tag smashed the previous record of £117m ($217m), which Britain's richest man Lakshmi Mittal reportedly paid this year for a home on London's so-called Billionaires Boulevard close to Kensington Palace. But even the latest record may not last long. Asia's richest man, industrialist Mukesh Ambani is expected to move into the 27-storey property he has built to house his family and offices in Mumbai next year.